This file photo shows former Haryana CM Om Prakash Chautala discussing a point with his son Ajay Chautala at a training camp for INLD workers in Hisar. The Supreme Court today dismissed the plea of former Haryana Chief Minister Om Prakash Chautala and others, challenging their conviction and award of 10-year jail term in the Junior Basic Training (JBT) teachers recruitment scam case. “We are not inclined to entertain any of these appeals and they are dismissed,” a Bench of Justices FMI Kalifulla and Shiva Kirti Singh said. Besides 80-year-old Chautala’s appeal, the Bench also dismissed the plea of his son Ajay Singh Chautala, 54, and others in the case saying that the Delhi High Court verdict was “reasoned one”. The court, however, said the convicts may move the high court with their pleas seeking relief like parole on health ground. 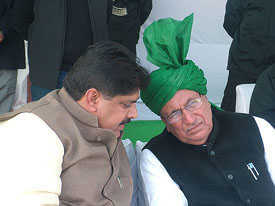 Chautala, his son and three others are serving 10-year jail term in the case. A Supreme Court judge had on July 6 recused himself from hearing Chautala’s plea saying he had appeared for some of the convicts in the case. The father-son duo and 53 others, including two IAS officers, were convicted on January 16, 2013 by the trial court for illegally recruiting 3,206 junior basic trained (JBT) teachers in Haryana in 2000. Besides Chautalas and whistleblower IAS officer Sanjiv Kumar, the then Director of Primary Education, the high court had also awarded 10-year prison term to IAS officer Vidya Dhar, then Officer on Special Duty (OSD) to the Chief Minister, and Sher Singh Badshami, then MLA and Political Adviser to Chautala senior. All the 55 convicts have been sentenced under sections 120B (criminal conspiracy), 418 (cheating), 467 (forgery), 471 (using forged documents as genuine) of IPC and provisions of the Prevention of Corruption Act. The high court had modified the trial court’s order on the quantum of sentence and awarded two-year jail term to 50 other convicts.